The Idaho Transportation Board will begin a three-day meeting in Boise next week with a workshop that focuses on the allocation of resources. The budget proposal will consider ITD’s priorities of operations, preservation, restoration and expansion. The workshop is scheduled for Wednesday (June 17) at the District 3 office on Chinden Boulevard. A regular monthly business meeting will follow on Thursday, beginning at 8:30 a.m., and a concluding tour of major District 3 construction projects is planned for Friday. Bids were opened Tuesday on three highway construction projects in Idaho that will use federal stimulus funding, the Idaho Transportation Department announced. Bids were opened last week on Idaho's first highway stimulus project, U.S. 95 Moscow Mountain passing lanes. Bids on a new Vista Interchange on Interstate 84; widening of Interstate 86 in Chubbuck/Pocatello; widening of Idaho 48 near Rigby and phase two of the Twin Falls Alternate Route will be open in June and July. Fire engulfed the trailer of a moving van on U.S. 95 south of Grangeville two weeks ago, consuming the trailer contents and igniting a 10-acre fire along the highway shoulder. Idaho’s primary north-south highway was blocked for approximately three hours while responders extinguished the fire and cleared the debris during the busy weekend travel. ITD’s Port of Entry system recently had work done on the three Weigh-In-Motion (WIM) scales in Idaho – in Boise and Lewiston – to prolong the useful life of the scales. The work, performed by the same contractor that installed the WIM scales, International Road Dynamics (IRD), involved removal of dirt and grease build-up and anything else that could hinder the WIM technology or the scales themselves. The Perks pot has gotten a little sweeter. A number of businesses recently joined the family of ITD friends that offer great discounts and savings for employees who present their PerksCard. The program, which is free to ITD employees, provides cardholders and their families discounts from “featured merchants.” In addition to local discounts, the PerksCard gives employees the ability to save through online shopping, printable coupons and gift card purchases. Tailgating, changing lanes without notice, speeding, running yellow lights, or ignoring traffic signs makes you an aggressive driver and ITD wants you to know that law enforcement patrols will be watching for you. The transportation department joins with law enforcement agencies across Idaho to make the state's highways safer by funding increased aggressive driving enforcement patrols June 12-21. Patti Raino traveled a long and winding road through 29 years with the Idaho Transportation Department, and she saw a lot of that road from the seat of a bicycle. Raino often rode her bicycle to work at ITD Headquarters – a reflection of her commitment to improving the environment through alternative transportation and maintaining good health through exercise. She retired May 29 as Intermodal Planning Manager for the Division of Transportation Planning. Warmer weather has arrived and with it comes an array of gasoline powered tools and toys that go into use. Whether it is a lawn mower, ATV, leaf blower or boat it may use gasoline. This is a season when people often increase the volume of gasoline stored on their property, according to the Ada City-County Emergency Management office. June is National Safety Month so here are some tips from the American Petroleum Institute on safe handling and storage of gasoline. An ITD 10-wheel truck proved to be more exciting than a piece of new playground equipment for kindergarten students in Cascade recently. 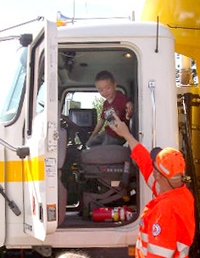 Megan Conner, whose father Dan works for the Cascade Maintenance section arranged for truck to visit Cascade Elementary School May 29. 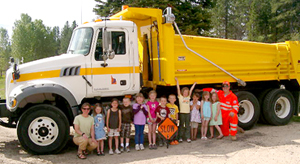 Students were especially enthralled with the horn and tarp that covers the truck bed. Dan also took the opportunity to give the kids a safety lesson. ITD began a pilot a project this week that allows employees at Headquarters an option to change their home address through the State Controller’s Web site. The process uses the same Web site where employees currently make health and dental insurance changes during open enrollment, view online pay stubs, view online W-2 forms, etc.